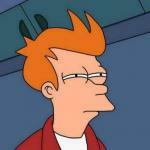 To answer your question, if you submit a meme, chances are very very high it will feature. I don't know what reason the mods would have for not featuring some memes, but just about all memes do get featured. Did they do something to piss off the mods? Do they just generally pick the wrong time and get lost in all the submissions? Do they get featured and then downvoted so much after the fact they are not featured anymore? If you delete your own memes after featuring it also lowers your percentage score. Some times submission just get stuck in the queue and lost. I still have 2 that are in submission state for more than a month. I resubmitted one of them exactly as it is and it feature straight away. Ah... Thank you, that helped a lot. I flag any non-english memes, so they go back into submission, as do many people. I've never heard of anyone complaining about their memes being removed from Featured status because they were not in English. If they did, who'd understand their complaint? it wasn't in English. I think some of the mods are afraid to reject them out of fear that they may be called on for being bigots, although that's the terms of our use, and it doesn't leave a lot of leeway. there's a guy with several alts that every week posts the same damn text over different pictures that I think always gets downvoted back to submitted. He must use them on a blog. but they make no sense. I had a few memes that had 50+ views before they were featured that I shared as soon as I submitted them. Mods must have thought that with that many views, I was using alts. A friend has the same problem. She gave me the link in an email, I shared, and the posts never featured. It would be nice if there was an autonote that gave even a reason why something is not featured. Gets little notification post### declined because #####. 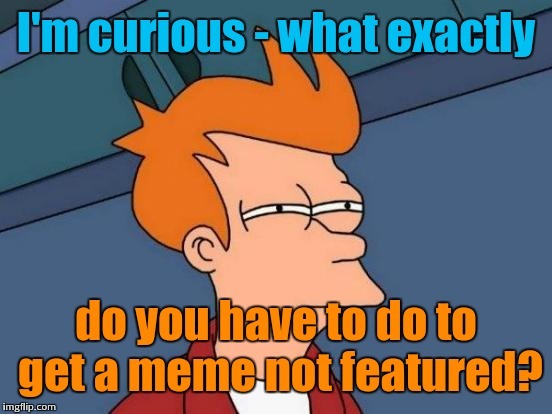 I'm curious - what exactly; do you have to do to get a meme not featured?